How the Miami Hurricanes rose from a laughingstock to a college football legend-and reshaped American sports. When fans think of college football, they think of Miami-the cool school with street cred that all the kids dream of playing for. A powerhouse unlike any other, they are a dynasty fueled not by individuals but by the aura of "The Miami Vice"-a swaggering, trash-talking, us-against-the-world mentality. But less than 25 years ago, the program faced extinction. Now, five national championships-and five different coaches-later, Miami is the preeminent football factory, boasting such high-profile NFL alumni as Michael Irvin, Ray Lewis, Warren Sapp, Jim Kelly, Vinny Testaverde, Clinton Portis, and Jeremy Shockey. Nothing is typical about the 'Canes. Not the brutal, "voluntary" 6 a.m. workouts in July. Or the merciless drilling of teammates who show fear. Not the constant pressure from their Godfathers, the ex-Canes who want them to uphold the legacy-and will make them pay if they don't. And certainly not the reputation that has made the Hurricanes synonymous with excellence-even among superstar athletes. Now, an award-winning sportswriter gives us a rare, behind-the-scenes look at the Miami program-after more than ten years of special access as a former UM student and beat writer. This is the amazing story of how Miami has won more national championships over the last two decades than Notre Dame, Oklahoma, and Florida State combined-and gone from near-death to dynasty. “Sportswriter Feldman (ESPN The Magazine) reports on the Miami Hurricanes' legendary success story without sugarcoating the team's notorious problems off the field, which include substance abuse, violence and scandals. The author shows how the team, which has been one of college football's powerhouses for 25 years, put the "nasty" in dynasty. Its’ players became the bad boys of college football, epitomizing the image of the academically underachieving, macho, entitled athlete; taunting their opponents and, as Feldman demonstrates, committing personal fouls basically for the fun of it. (Indeed, the statute prohibiting such behavior has become known as "the Miami rule.") Not that everything always came easily. With a frenetic, fast-moving narrative, Feldman tells how Miami's coaches stayed consistently ambitious and hungry, always looking to make a name for their team. Several Hurricanes players have gone on to the NFL, more often than not as first-round draft picks (notably, Vinnie Testaverde and Bernie Kosar). The 'Canes' success, says Feldman, lies in their ability to replace departing stars with players of equal or greater talent. 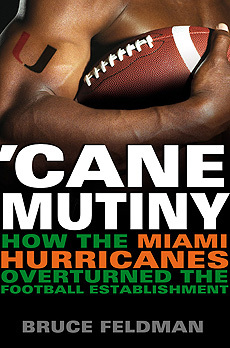 Whether he's writing about Ray Bellamy becoming Miami's first black player (in 1966) or the team's amazing track record (they've won more national championships over the last 20 years than Notre Dame, Oklahoma and Florida State combined), Feldman's knack for storytelling will draw readers in.